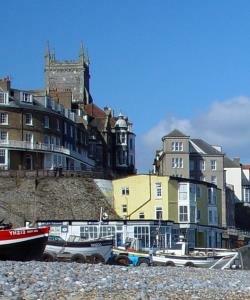 Cromer TownCromer, the Gem of the Norfolk Coast, is as delightful for modern-day holidaymakers as it was for Victorian and Edwardian tourists. Cromer's famous pier spans the centuries - construction began under Queen Victoria, but it opened in 1901 soon after her death, and its hardy engineering has kept it standing into the jet-setting, internet age. It's an unspoilt pier, with none of the droning sounds of amusements, and where the only dancing lights are to be found in the Pavilion Theatre - home to the country's only remaining traditional end-of-the-pier variety show, the sell-out Seaside Special. Cromer Pier also houses the town's lifeboat, and families thrill to go crabbing along its deck while fishermen cast long lines from dawn to dusk. For this is life by the sea, and Cromer is still very much a working town, behind the towering townscape that rises dramatically from the beach chalets and the crab boats pulled up on the sand after early mornings bringing Cromer's famous shellfish delicacy to our plates. Cromer, the Gem of the Norfolk Coast, is as delightful for modern-day holidaymakers as it was for Victorian and Edwardian tourists. Two museums in the town look back at the centuries of that working life. Cromer Museum, housed in a row of fishermen's cottages adjacent to the 14th Century Church of Saint Peter and Saint Paul (the tallest in Norfolk) displays local history as well as geology and archaeology, while the RNLI Henry Blogg Museum (which takes its name from the RNLI's most decorated lifeboatman, a revered son of Cromer) charts the town's proud lifesaving heritage.